This house is designed to provide comfort in a variety of climates: dry, humid middle latitude, continental, and cold. Water collection, treatment and conservation, together with the fine insulating properties of earth, provide the principals on which this ultimate passive solar design is founded. Earth-sheltered buildings best protect against extreme temperature variations, storms, earthquakes, noise and sadly, even military air strikes. With this in mind, as well as the passive design principles of internal heat zoning and compact planning, this EcoHouse was designed. 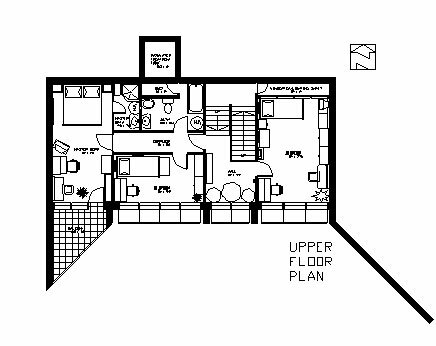 The living room, the kitchen, the dining room and the bedrooms all face maximum sunlight, whereas the secondary spaces spread along the part of the house which is fully sheltered by earth. Special emphasis has been put on the utility room to accommodate heating installations, but which can also be modified to serve as garage, storage, or a guest room accordingly. The house could be ideally embedded into the sloping ground of a mountainous region, but can also be built on level ground of valleys and plains, since excavated earth could easily be bermed to cover the building on three sides. Masonry walls and foundations are made of recycled concrete blocks with recycled paper fillings. Recycled glass is used for floor insulation, as well. An insulating entry air lock has been provided, together with sliding doors with tempered, insulated glass. All windows are sliding, double-glazed, with the possibilities of the beadwall system employed. 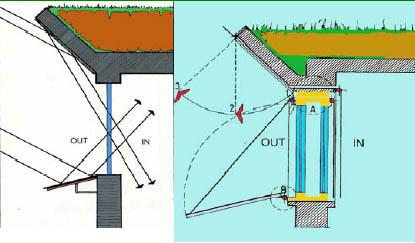 Water-saving toilets, and other water-saving equipment has been used throughout the project. All installations between the lower and upper floors run through a vertical service duct, which is also fully accessible for inspection and maintenance. Spaces include: living room, kitchen and dining, entry,utility, store room, half bath, and laundry. 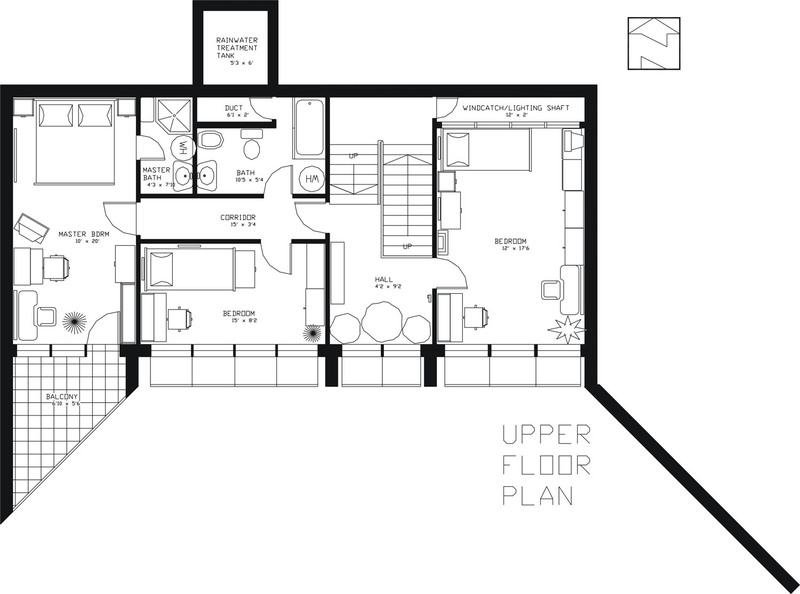 For a larger view of this floor plan click here. Rooms include: Master bedroom, master bath, bedrooms 2 and 3, and bath. 4) Heat sink greenery 5) Indoor greenery. 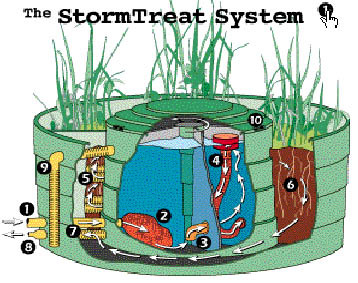 The collected water is then thoroughly treated for domestic consumption using the state-of-the-art StormTreat System produced by StormTreat Systems, Inc. Rainwater is treated by 100% biological means and is 100% safe for domestic use. of the house, in turn, may eat the crayfish. Please bear in mind, that if you are a vegetarian, or would not readily support such a food chain under your own roof, you can always use the pond as an internal fountain, or an aquarium instead! The windcatches provided for natural cross-ventilation are provided with skylights to serve as additional natural lighting sources. The skylights should be directed to face your prevailing winds and/or natural light sources. 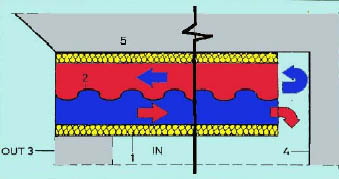 They are designed with an inner reflecting surface attached to to an insulating board. The former reflects sunlight into the home, the latter prevents heat losses from inside to the outside. 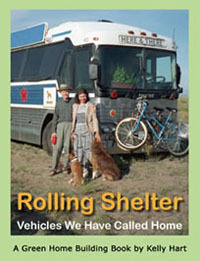 Recycled exhaust and foul indoor air has been used to heat the cool outdoor air entering your EcoHouse. 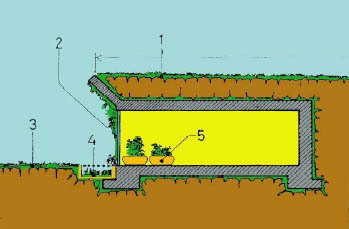 The ceiling runs the length from northern to southern wall respectively, so that the rising, hot indoor air heats up the incoming cool/cold air, using the principles of convection.1) Lower insulated ceiling surface 2) Metal divider 3) Southern wall of the EcoHouse 4) Northern wall of the EcoHouse 5) Upper insulated ceiling surface. The windows oriented towards the sun attract maximum solar radiation during the cold season, but are also provided with external reflecting surfaces and rigid insulating boards that are operated manually. You can regulate the amount of sun needed throughout the day/year and close the shutters completely at night to store the solar heat collected during the day. 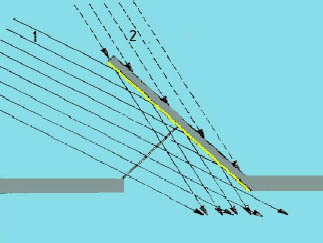 1) Reflecting position 2) Shading device position 3) Precipice protection position. When building a new home, you will need working drawings which provide hundreds of additional details. You can save time and money by purchasing these eco-home building plans, professionally designed and produced in English language to meet ISO and BS recognized building standards. Best of all, you will only pay a fraction of the original design cost because the design cost is shared by so many people all over the globe. 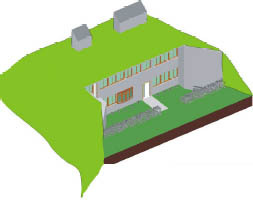 Shows the proposed site layout of your eco-house and the corresponding design elements. Show foundations with all load-bearing points and footings applicable to your eco-home. Show the placement and dimensions of all interior walls in your eco-house floor plans, materials, levels, specifications, etc. Show roofs with all constructional elements, specifics and dimensions applicable to your eco-home. 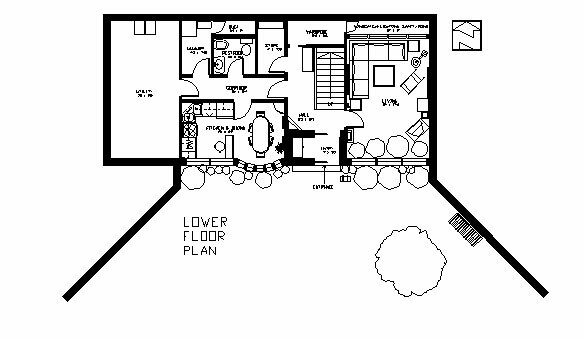 Cross-sectional views of your entire eco-house, with materials, marked details, sectional labeling, dimensions, levels, roof pitches, etc. 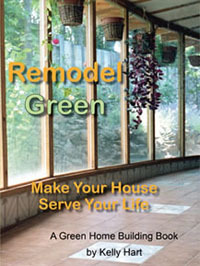 Show exterior materials, details, and all necessary measurements from all sides of your Eco-home. Shows additional details and dimensions of elaborate staircases, ramps, elevators, and other vertical circulation means within your eco-home building plans. Shows additional details and dimensions of elaborate ecological window and door designs within your eco-home building plans. Show additional details and dimensions of active solar equipment (e.g. solar collectors) within your eco-home building plans. When placing orders for plans you can choose between downloading your purchased plans from the Internet, and/or ordering plans printed in black and white on ISO A3 recycled, acid-free paper, containing a minimum of 50% recycled de-inked fiber paper, register airmailed to your postal address. 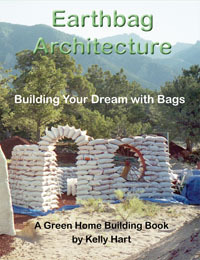 By expressing preference for the printed version of the purchased design, and including an extra-charge to cover the plotting and shipment expenses, you could not only have the CAD Working Drawings that you could modify to meet your requirements of your energy-efficient dreamhouse, but the printed version of the original, as well! The facility of black and white print on A3 format means that you can literally photocopy your EcoHouse plans to as many copies as required by your local building rules and regulations. Likewise, the structural calculations, the materials lists and the specifications, are all printed on Letter and A4 paper formats respectively, which further facilitates reproduction for your needs. 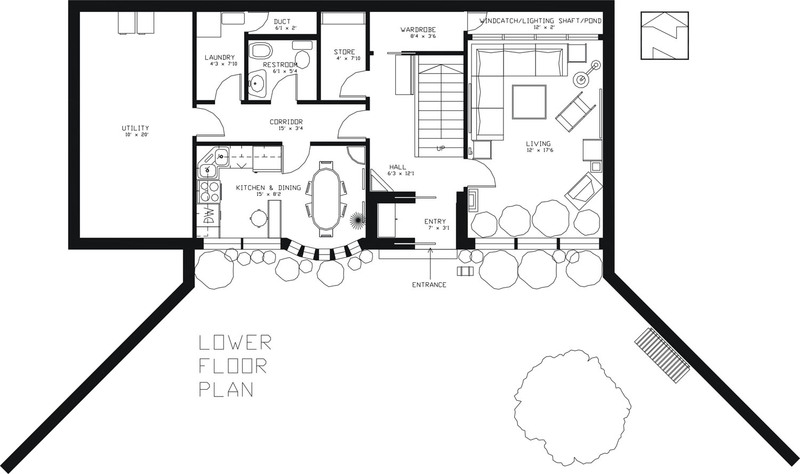 Included with the printed plans is a business-card CD comprising the house plans in CAD and PDF format. For ordering the CAD files only, once you have placed your order and your payment has been processed and approved, an email with your Internet download address is sent automatically to your registered email address. Each download address can be used once, and once only. Should you encounter any difficulties or inconvenience with the download, please contact us immediately. Ferid Abbasher and Associates usually create designs on computers by using CAD (Computer Aided Design) software. The most common type of CAD files are the DXF files, which can be opened by various brands of CAD software. The DXF files downloadable for our designs give you all the features you would get from the blueprints for the same eco-house, and still have all the important details you need to build an eco-home. There are also software utilities available that let you convert a CAD file from one format to another. If you need a different file format we can sometimes provide other file formats. If you have a question about what version the CAD file will be, then please ask about this before ordering.